I'm using the stamp of the month for April for the Open Stamping on 4/28. This will be the last one before I travel up to Minnesota. I'm hoping to see my friends one more time before I go! 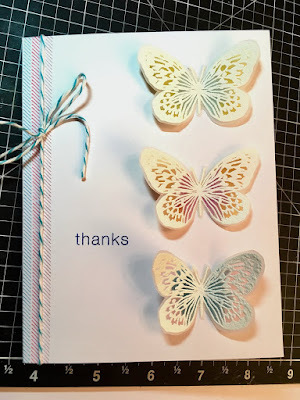 I stamped and heat embossed on vellum for the butterflies. Then I colored them with the Shin Han (alcohol) markers and cut them out. They were adhered to the card front with just a sliver of tape adhesive under the center of the body so that the wings could be lifted. The stamp set also had a nifty, small diagonal stripe border that I stamped in three different colors. I added a small twine to cover up the small gap between the Blossom and Sugarplum borders. The thanks is also in the same stamp set and I used Bluebird, but will use Carolina next time since it's just a little softer. We were in a death-watch for several weeks and finally went to the funeral (Steve performed with the Bishop of New Hampshire). 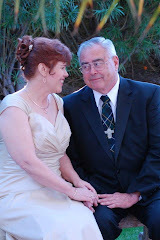 It was a very close friend of Steve's (50+ years) and his family was there. I feel so close to his widow, Susanne. She is one of those people who make you feel instantly loved. Our time together this visit was short, but we packed in a lot of story telling and as much laughter as possible. As always, it's good to be home. Beautiful card, Sharli. Love the delicate and pretty butterflies. The peek of color is so lovely. I hope you get to see all your friends before you head up to Minnesota. I am so sorry for the loss you and your husband are going through. So difficult, even if it is a part of life. Grateful you can be there for his widow. Gentle hugs to you all! 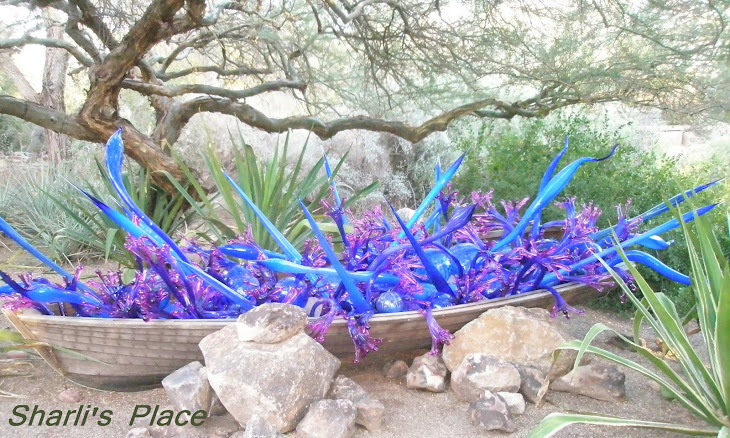 My banner photo is from the Chihuly glass exhibit at the Desert Botanical Gardens in Phoenix, AZ. My daughter and I visited there on her trip home February 2009 and took some beautiful photographs. 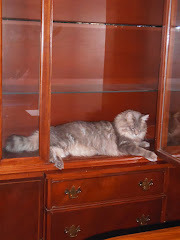 We both loved this boat load of glass! Where random art work, thoughts, and stories will find a place to stay - for awhile. 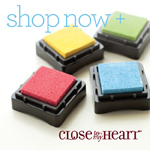 I'm a child of God, a wife, mom, friend, scrapbooker and stamper. In addition to my beloved husband, I love yoga, Bilbo (my cat), playing in my studio, and puttering in the garden. I am looking forward to spending time with grandchildren! That's MISTER Cardmaker, to you!